Born at Smithfield, Ontario, on 1 March 1849, a son of George Ferdinand Bull and Charlotte Potts. He was educated in the public school of Smithfield but showed an early bent for business. At the age of 14 he went into a general store in Brampton, Ontario, and spent twelve years there. For seven years after that he travelled for a wholesale tea company and then joined the westward trek of young men. His first business venture in Winnipeg was establishment of the city’s first commission house in 1882, in partnership with William F. Henderson. Seven years later he took over the Royal Crown Soaps Company, becoming President and Managing Director. The plant was operating in St. Boniface, but Bull no sooner assumed the managership than he moved the plant to King Street, and enlarged it. 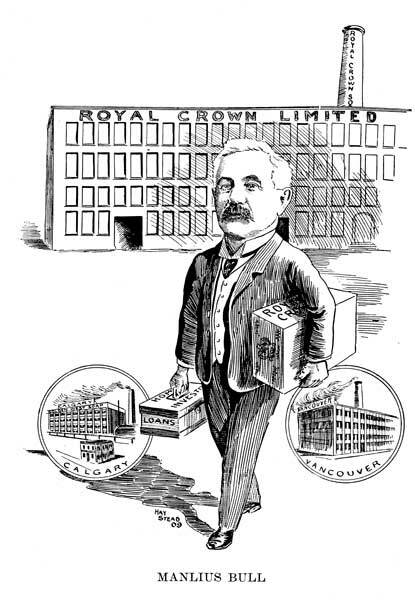 In 1910 Lever Brothers took over the soap business but Bull continued as its Canadian head. His activities extend far beyond this business. 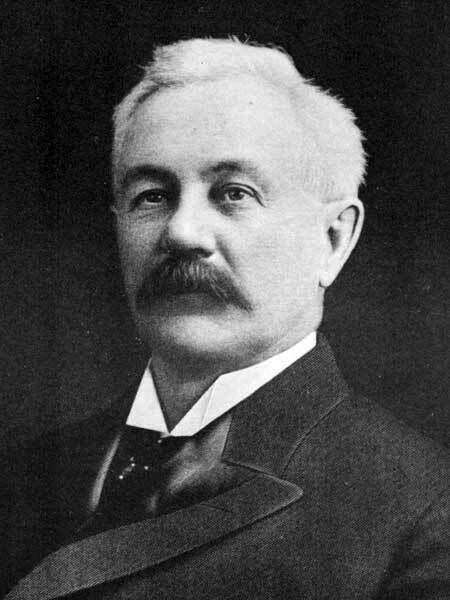 At the time of his death he was President of the Home Investment and Savings Association, president of the City Provincial Loan Company, president of the Standard Trusts Company, director of the Great-West Life Assurance Company, and a director of the Union Bank, which merged with the Royal Bank of Canada. Bull was a keen sportsman in his young days and in later life he was an ardent golfer. Many athletic organizations received generous support from his purse. He was a member of the Winnipeg Golf Club. His real hobby was gardening, however. He was one of the first to plant a garden south of the Assiniboine and his work, which extended beyond the bounds of his own fence, served to help in establishing Roslyn Road and the Wellington Crescent districts as the prettiest residential areas in the city. He was an active force in promoting the ideal of the city beautiful and in getting broad boulevards. On 10 November 1875, he married Mary Nixon (1852-1938) at Peterborough, Ontario. They had seven children: Clara Bull (b 1876, wife of John L. Waller of High Prairie, Alberta), Annie Charlotte Bull (b 1879, wife of W. B. Stirling of Vancouver), George Bull (b 1882), Lillian Bower Bull (b 1884, wife of John Flanders), Percival Manlius “Percy“ Bull (1887-1959, husband of Geraldine Stephenson, daughter of E. F. Stephenson), Wilford Edward Bull (b 1889), and Roland Osborne Bull (b 1895). He was a member of the Manitoba Club, Carleton Club, St. Charles Country Club, and the Manitoba Fishing and Hunting Club. He died at Winnipeg on 3 March 1929. “Manlius Bull dead; pioneer of Winnipeg; ill one week, passed 80th birthday Friday; funeral Tuesday afternoon,” Winnipeg Tribune, 4 March 1929. Obituary [Geraldine Stephenson Bull], Winnipeg Free Press, 28 November 1961, page 25.